Welcome to our world of fabulous antique décor and design! Are you ready to make your home beautiful? 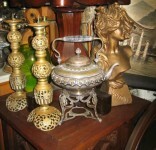 We are here to help with great antique furniture and accents for any and every room in your house. Ready to decorate your yard and garden? We have an extensive collection of antique and vintage garden furniture and accessories.